Created by Hollywood makeup artist Jeanine Lobell in 1994, Stila is an innovative brand that aims to make beauty fun and approachable for all kinds of women. They offer a full line of top-quality products in trendy, fashion-forward colors made to be naturally wearable. Stila cosmetics are predominantly available online. You can also find them at stores like Macy's and Sephora. Stila Cosmetics: Shop at the official Stila website for online exclusives, last chance sales, and the latest products. Sign up for the newlsetter for more savings opportunities. You can also check the store locator if you prefer to shop in a brick-and mortar location. Ulta: At Ulta, you can browse according to Stila Favorites, by collection, or by look. Skin Store: Skin Store allows you to see user product ratings at a glance; you'll also find tags for 'new' items and 'specials' to help you make your selection. Derm Store: Shop by specific product type or see new and featured items. If you are already familiar with Stila and buy their products often, Derm Store also offers a Stila Express shop, where you can quickly check the SKU number of the product you need and purchase that product(s). Amazon: You can find a range of Stila products at Amazon, and some are available with the 'subscribe and save' option, saving you time and hassle so you don't run out of your favorite product. Lovely Skin: Browse according to category, product, ingredient, or new or clearance items here. Lovely Skin also offers a ten percent back rewards programs when you purchase the Stila brand. Sephora: The large number if filters at this beauty superstore such as formulation, color family, and benefit, make it easy to find the specific products you want from the brand. You'll also find online only and exclusive Stila products sales at Sephora. Macy's: Stila products are sorted by basic categories like eyes, lips, and face at Macy's. Shop here for free gift with purchase events and occasional shipping deals as well. Stila offers a wide selection of makeup and fragrance products designed to fit their chic yet easy-going approach to beauty. All products are available in a broad spectrum of colors and are packaged in eco-friendly materials. Face: Stila has several options of primers, foundations, concealers, powders, and tinted moisturizers. Among their bestsellers is One Step Correct, a primer that simultaneously corrects skin tone, reduces the appearance of pores and lines, hydrates, and illuminates. Cheeks: You have your pick of blush, cheek stains, and bronzers at Stila. The Convertible Color Compact cream blush is a long-time customer favorite and award winner. 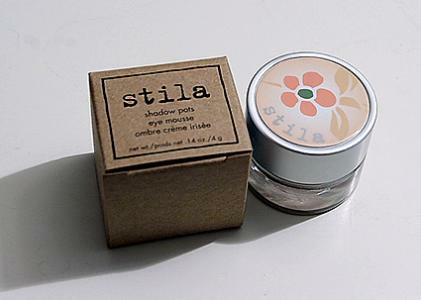 Eyes: The Stila Smudge Pot, both a gel liner and a shadow, is among their most well-known eye products. They also offer shadow palettes, liners, brow pencil, and mascara. Lips: In addition to their famous Lip Glaze, Stila also makes lip stain and gloss available in a limited palette of universally flattering colors. Tools: Stila offers a selection of brushes for the face, eyes, and lips to compliment their product line. The Stila cosmetics line was created by Hollywood makeup artist Jeanine Lobell in 1994. Since it's launch, Stila has gained a loyal following in the beauty industry and among everyday women. Stila is known for their innovative products in trendy colors and packaging that attract an equally hip crowd of consumers. They never test their products on animals and everything is packaged in eco-friendly containers that are recyclable, sometimes reusable, and always produced via methods creating the smallest carbon footprint possible. Stila's effortless chic style and socially conscious business practices have won the brand acclaim amongst users and many prestigious awards within the industry.